Congratulations to all those who answered Pikey’s rallying call to volunteer for battle at Coalville in the last race of this year's Women’s Team Series. After the penultimate race at Darley Moor TCC was lying 4th – the highest ranked club behind the sponsored ‘cherry-picked’ teams – and in with a slim chance of making the podium if we won all the points and Squadra Donne won none… well, I did say ‘slim’! It was fine day and, after yet another 2hr blast up the M1 with Captain Lisa at the wheel of her capacious chariot, the team arrived in good time to discuss tactics and devise a cunning plan of attack, which cannot be divulged in case the opposition are looking in... We also had a chance to explore the course – six undulating 9.2mile laps, seemed like long descents and a few short sharp ups, with a punishing hill just before the last turn and short sprint to the finish. Eventually two girls decided to give chase and once again nobody followed. When Newsworthy tried to breach the gap her efforts were thwarted by lack of support from two others with her who, it transpired, each had a rider up ahead and had no intention of helping her to reach The Ox.. Politics politics – boy did this frustrate Natalie! GB Corrine also tried to break but was held back by her fellow ODP hopefuls. The two up ahead finally caught The Ox, just pipping her to the post for the first prime in lap2 – what a shame but a great effort from The Ox. Meanwhile, our cheering Captain was a welcome sight, pedalling past in the opposite direction. Back in the midfield we were feeling strong, and Pikey was particularly pleased to stay with the bunch for the lap2 prime – a first for her! 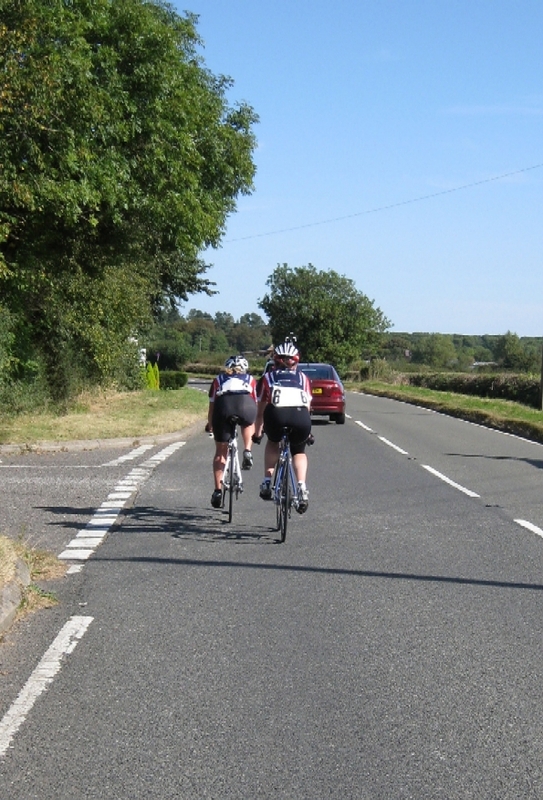 Then the pace slowed and soon IronMan and Vice Captain were riding shoulder to shoulder with Pikey again. The next lap passed without incident, bar Pikey having to offer some polite verbal advice to a line of vehicles (including several race cars) held up behind the bunch, too close to the kerb for the midfield to squeeze past – but squeeze past they did and soon caught up again. 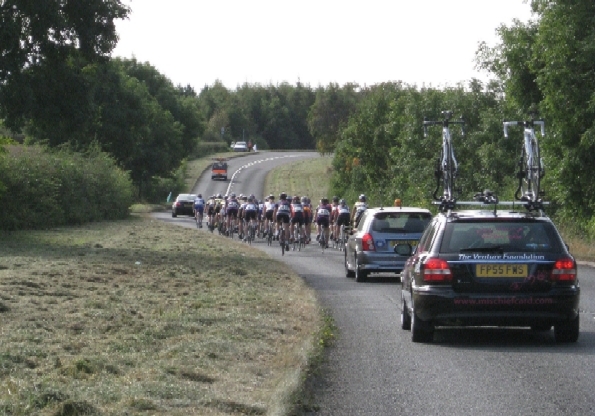 Each lap the punishing hill was taking its toll and after the 3rd assault the field was beginning to string out. Another sighting of Captain Lisa and not long later there she is again – Blimey! (thought Pikey) she must be doing as many laps as us! What’s like riding up all those long descents? Into lap4 and Pikey is still with the bunch! Suddenly she notices The Ox just ahead of her and wondered how that happened… Nearly time to unleash the cunning plan and Pikey tries to work out how she can creep up to the front to help, but the second prime finally splits the bunch and she is unceremoniously spat out the back with a few others. A most enjoyable race full of opportunity but, despite valiant effort, somehow we didn’t manage to secure the 1st 2nd 3rd and 4th places needed to move up the table. The cunning plan hadn’t quite come off, but at least we HAD one! The race is finally won by the two who chased The Ox, with GB Corrine near the front of the pack, The Ox and Newsworthy a bit further back, and then the by-no-means-last midfield. There was no change in the final placings in the Team Series: 1st Mischiefcard.com, 2nd Max Gear RT, 3rd Squadra Donne and TCC a fine 4th, well ahead of Impsport in 5th and London Dynamo 6th. 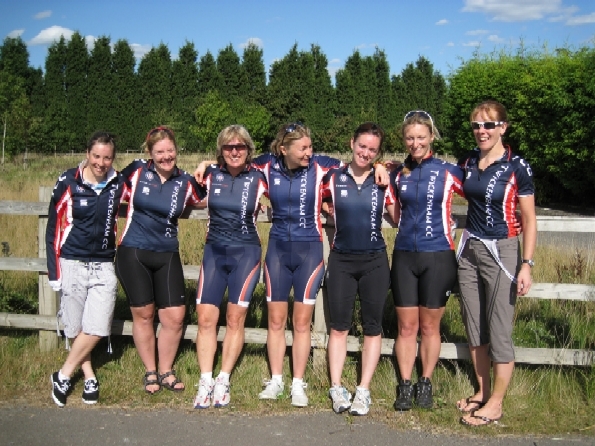 Overall a great effort by all the girls who rode for the club – most of whom had never raced before – with fantastic support throughout the year. And where would we be without the incredible Captain Lisa and Vice Captain V! Lisa said this year’s objective was simply to support and encourage new girls to race, and she did just that, even with a 3-month sabbatical! What can I say but a HUGE thank you, and let’s kick 2010 off with a bang in the first race of the new Women’s Team Series, which is organised by none other than Twickenham, and for once it’s not miles up the M1 but in Windsor! April 18th – put the date in your diary now.